Lee Montgomery is the editorial director of Tin House Books and executive editor of Tin House magazine. She is the author of Whose World Is This? (University of Iowa Press, 2007), winner of the 2007 John Simmons Short Fiction Award; Searching for Emily (Nothing Moments Press, 2007); and The Things Between Us (Free Press, 2006), winner of the 2007 Oregon Book Award in creative nonfiction. We ended up moving to Portland, Oregon, twenty years ago, but never meant to stay. My husband, Thomas, was commuting there from our canyon town outside of Los Angeles during the week for a work project. I came for a weekend visit, and on a walk we fell in love with a sweet little Victorian located not too far from the Willamette River on the not so trendy east side. We bought it a day later. I’m not sure what I was thinking. I had lived in Portland for a year in a previous life, when working as a research assistant at Oregon Health & Sciences University for a college co-op, and the rain—relentless and cruel—made me truly miserable. Twenty years later, after one hundred days of the same stuff I experienced during my first year here, I remembered why, but life was different now. I was no longer a budding scientist doing fetal breathing studies on sheep (i.e., murdering sheep), but a writer, and rain and clouds, well, made for excellent reading and writing in front of the fireplace weather. 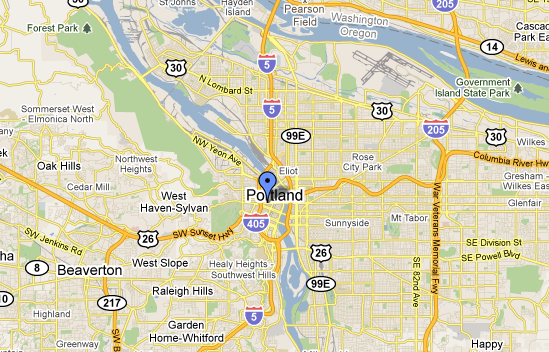 Portland is a city of two rivers that sits on the trajectory of the Cascade Mountain Range. The Willamette, a tiny river that runs through the city, hooks into a mighty one, the Columbia, which provides the border between Oregon and Washington and snakes through much of the Northwest—Oregon, Washington, and Idaho—and up through British Columbia. What this means is less than twenty miles east of the city is the Columbia River Gorge, a national scenic area of unbelievable beauty. The winds howl through this corridor, which is a nuisance, unless you are a windsurfer, which I became after a year or two of living here. The mountains are not far either, so in the winter when the rain beats down, ten thousand feet of Mount Hood calls because rain in Portland is snow on the hill. Cancel work, pop in the car, and an hour later you are floating through the muffled silence of white. You can also night ski, which I always thought was truly ridiculous, until I went. When it is snowing hard on the mountain, night skiing at Skibowl is some of the best skiing I’ve ever done. An hour and a half in the other direction from Portland is what natives call the coast. Storms roar in off the Pacific crashing against a rocky dramatic coastline. Thomas and I spent a Memorial Day weekend there once and witnessed the most intense torrential rains and high seas I’ve ever seen. Dark clouds whipping, angry waves the size of skyscrapers, and shades of gray that were almost blue. Though this is not my issue, stormy weather is addictive for some. When author Charles D’Ambrosio, who grew up in the rains of Seattle, first moved to Portland, he made regular sojourns out to the coast to witness true rain. Portland rain was not enough. The Indians say the Willamette Valley, where Portland is located, is a healing valley. This might be true. Much of the year, the town and its people are blanketed in clouds and mist, making life much of the year an interior affair. Living in fog takes some getting used to. For me, when I’m not working, I need to get out of the clouds. The energy of the natural world is a perfect antidote to living inside my head, which becomes a little hectic. So, when I’m not working, very rare these days, I trip around town from the Tin House offices, which are located in an old Victorian with corrugated zinc siding in the northwest area of the city, to readings, coffee shops and bookstores. Powell’s City of Books (1005 West Burnside), touted as the biggest independent bookstore in the world, has to be any writer’s or reader’s first stop in Portland. Four floors, one city block wide, I don’t know that there is anything like it anywhere. On the rainy dark days of winter, I like to lose myself at Powell’s. I start in the New Books, Debut Authors section, and then move into the Blue Room, which houses fiction and poetry. In addition to new books Powell’s carries used ones, so one can find gems—first editions, out of print titles, et cetera. Powell’s also sponsors a vigorous reading series featuring authors from all over the world several nights a week at the downtown store, the Hawthorne store, and their new suburb store at Cedar Hills Crossing. Broadway Books (1714 NE Broadway), whose mission, says founder Roberta Dyer, is “to find the book that will change your life.” The store was hand built with borrowed money in 1992 and has a wonderful staff. On my days off, and on Sundays when waiting to be seated for brunch at the neighborhood Cadillac Café, I wander in to see what’s showcased on the recommended wall—always good choices—and to see the beauty of hand-selling books in action. A strong magazine section, staff picks, readings, and a great local following make this store hard to beat. The Loggernaut Reading Series, founded in 2005 and directed by Erin Ergenbright and Jesse Lichtenstein, who also edits the online magazine Loggernaut, is a popular and smartly run monthly event. Each event features local and visiting poets and writers—past readers include Tom Bissell, Charles D’Ambrosio, and Laila Lalami—reading work revolving around a theme. If it’s winter in Portland, it’s readings at the “Schnitz” (1037 SW Broadway), a longtime Portland tradition. Portland Arts & Lectures began over thirty years ago as a small author reading series designed to bring leading authors and cultural thinkers to Portland, which, then, was hardly on the literary map. Within four years, demand for tickets moved the series from the First Congregational Church, which has a seating capacity of 800, to the 2,700–seat Arlene Schnitzer Concert Hall, where it currently resides. Speakers at past events include authors such as Margaret Atwood, Ursula K. Le Guin, and Natasha Trethewey. The Heathman Restaurant and Bar (1001 SW Broadway), located in one of the oldest hotels in the city, is where friends assemble before an evening of Portland Arts & Lectures. It’s located downtown, next to the Schnitz and is immediately recognizable by the valets who stand out front wearing Old World Renaissance–style hats, coats, and knickers. The bar in the back by the fire is an elegant affair. Martinis and salmon hash, a Heathman staple, are sometimes called for, but best to limit before-lecture fare to tapas and wine. (Otherwise, you might join the quite famous snoozers—local literati snoring in the front row.) The hotel is proud of its literary associations: It’s a favorite place to stay among local and visiting authors alike. The staff keeps a catalogued library featuring more than two thousand signed books for guests to borrow and offers a Powell’s Book Package, which includes a Powell’s mug and tote bag; a twenty-dollar gift certificate for Powell’s; a five-dollar donation to Start Making a Reader Today, a local children’s literacy program; and a newly renovated room complete with Smith Tea. The Mountain Writers Series (2804 SE 27th Avenue, #2) is the oldest literary organization in the Portland area. Founded as a community college reading series in 1973, it quickly expanded to be one of the leading literary presenters in the Pacific Northwest. One of its claims to fame is this is where National Book Award–winner Denis Johnson met Cindy, his wife of twenty years, who was then part of the staff at the Mountain Writers Series. Up the street from the Tin House offices is Forest Park, a five-thousand-acre park that serves as my muse. During the summer and fall, I spend endless hours roaming the seventy miles of wooded trails. More than one hundred twelve bird species and sixty-two mammal species frequent the park and its wide variety of trees and shade-loving plants. Besides receiving forty inches of rain, the park’s biggest claim to fame is it is the setting for author Peter Rock’s latest gem of a novel, The Bewildered. The park, like many of the woods in the Northwest, has hanging moss and giant fir trees reminiscent of Hansel and Gretel’s woods. You can even follow a trail that runs adjacent to a stream and find remnants of a stone cottage. Trails spin off everywhere; it’s truly a beautiful place to gather thoughts and let oneself dream. The problem with working full-time running a literary press, being a writer, having a husband, and raising a daughter, is I am too busy to take advantage of a lot of the greatest literary events and writers spaces that Portland now offers. Still, those I am about to list have major buzz. Back Fence PDX, a reading series hosted by the Curious Comedy Theater (5225 NE Martin Luther King Jr Boulevard) in northeast Portland, is the kissing cousin to San Francisco’s Porchlight Storytelling Series and New York City’s Moth Mainstage. Their Russian Roulette shows feature six performers who tell true, unmemorized, original-to-the-stage five-minute stories based on a prompt chosen that night. The Independent Publishing Resource Center (318 SE Main Street, #155), upstairs from Reading Frenzy, is one of the only nonprofit self-publishing centers of its kind anywhere in the world. I am so impressed with their program I actually give them money, and I don’t give money to anyone but the Humane Society and the Antioch Review. It offers access to workspace and tools to aid in the production and distribution of zines, comics, hand-bound books, and artwork. This includes computer workstations for writing, scanning, graphic design, and desktop publishing; two copiers; five tabletop letterpresses; a Bind-Fast 5 perfect-binding machine; and various other tools for creating and binding publications. They also have one of the nation’s largest circulating zine libraries. In twenty years they’ve provided services to approximately thirty thousand people through their facilities, workshops, and outreach programs. Attic Institute, named for the large attic space it inhabits at 4232 SE Hawthorne Boulevard, was founded in 1999 by poet David Biespiel as the Attic Writers’ Workshop and has since become a “nexus for a vibrant community, where writers have developed literary friendships, seeded collaborations, writing groups, and magazine start-ups.” The Attic offers writing workshops that have been taught by Portland authors such as Karen Karbo, Cheryl Strayed, Matthew Dickman, and—one-on-one consultations for writers through their Individual Consult Group. With all the activity in Portland’s literary world, one could spin around endlessly taking advantage of the scene without much effort. Still, the best place for me is in, on, or around the river. When in town, I walk along the Willamette, which is not so much a picturesque river but a working river. The train whistles, the tugboats tug, and most of the seven bridges that span it are draw bridges, which, when in action, are truly a great spectacle. But during spring and summer months, any chance I get, I head east to the gorge and the mighty Columbia River, buzzing out of town on Interstate 84, which within ten minutes opens to the unbelievably beautiful river gorge—its rich green, jagged hills and cliffs that border both sides of the river, with majestic Mount Hood in the background. Forty minutes later, I am out of my head in the middle of the river—sailing, swimming, floating. Although not in Portland, Pacific University's respected low residency MFA program is just west of the city in Forest Grove. And since I have lived the last 32 years full time on the coast (my family has 100 summers as of 2011), I can vouch for the rainfall. When our son went to the University of Washington for his undergrad degree, he was amazed that people complained about the rain in Seattle. "It never rains," he said. It mists most other places compared to what we see come sideways, rarely "down." is a long URL, and a little portal Matty Byloos & I put together to catalog the reading series here--poetry is especially well-represented (Bad Blood, If Not For Kidnap, Small Doggies, Smorg, Spare Room, The Switch, Tangent, Three Friends, etc.). Reading Local has a great Portland site as well. There's also readings in Director Park (sw Oak st.) every Monday night through the summer, plenty of art/words showings/readings in last Thursday, first Friday, etc. etc. etc. events... maybe more actually than I want to remember right now. All that said. Portland Arts & Lectures? Really? Tickets are like forty dollars. Bad Blood readings brought Joe Wenderoth for a suggested five dollar donation plus a free broadside and free PBR. Just sayin'. Interestingly, I recently heard that original natives of the mountains surrounding the Willamette valley (I have a close friend who would track me down and lecture me into submission if I seriously called her an Indian) considered it the valley of death because it was so damp and moldy. They thought the whites were crazy for trying to live down there. I can't say either way. I live in Southern Tennessee and in the now-becoming-trendy Northeast side community of Monevilla at MilePost 5. I love Portland and I wish I did not get so sun starved there in the winters. If I could move out there to the high desert and come into town regularly I would. I once had a run in with a policeman in Portland. It happened on a rainy night, lo, these many years ago. I was running cigarettes illegally from L.A. to Portland. I did not live there, but rather in Maywood Park, which of course, is the cradle of all of civilization. The lights and siren were turned on and I pulled over. Basically it happened very fast; the cop had me open the back truck doors, found the booty and wanted a split. Having just read of Serpico's testimony in exposing corrupt cops, I took his call to duty quite literally. He was made famous in the movie Serpico with Alphonse Pacino. I had with me my trusty All-American Slingshot. That was the trade name. I pulled back and hit the pig a glancing shot in the forehead. He was dazed. I took advantage and headed off into the rain darkened night. It was in all the local papers. I was like Jesse James (better looking though) without the bother of riding a horse. I had a fast to faster automobile. They never caught me. I fled, surprisingly enough, to Hillsboro. As I drove there, I threw my slingshot into culvert alongside the road. I got lucky. An old couple kept me hid from the pigs. Ma and Pa Ireland told me stories of when Hillsboro was a liquored-up boom town. Pa broke out his old six-shooter. We drove out into the Big Green Region. Pa told me about gold mining in the area. Then we played cowboys and Outlaws jumping behind trees and making believe we were shooting at each other. I know that afternoon took a good ten years off Pa's life. Finally, it was time to head back. When we got back to the house, Ma called us a couple of no-be-goods and ordered us to warsh up for supper. She made some Irish soda bread with corn beef. I'll always remember my time with them - forget American Gothic - them two were the true living ones. I spent six, six, six (did I mention six?) days with my elderly co-conspirators. I know all of Portland's secrets - better than you do. Plus I know how to spell it, P-O-R-T-L-A-N-D'S. How do you like them apples?